Address: Angel Street, Hadleigh, Suffolk. Charles Holmes was born in Hadleigh in 1895. He was the son of John and Elizabeth Holmes and in 1901 the family lived on Angel Street, Hadleigh. Also living at home at that time was Charles' older brother William and younger sister Alice. 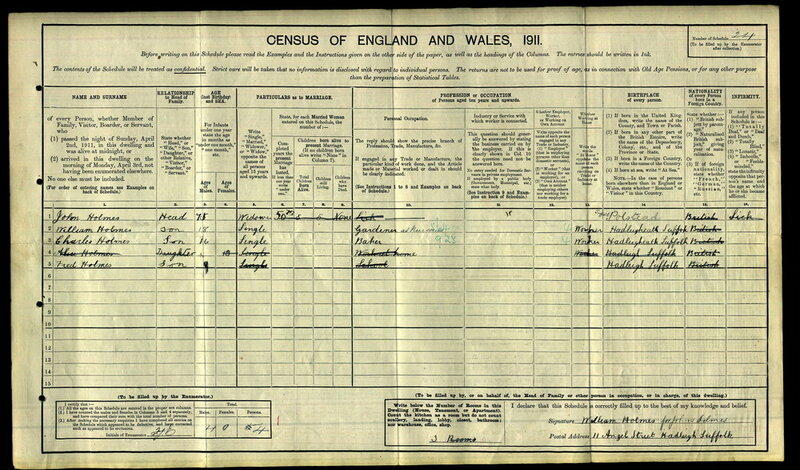 By the time of the 1911 census, the family was still living on Angel Street and Charles was working as a baker. Sadly however, by that time, his mother had died. In 1912 Charles and his older brother William enlisted into the Army. We know that William joined the local territorials, the 5th Battalion the Suffolk Regiment on 27 January 1912. However, on the 27 July 1912 and with his CO’s permission he joined the 2nd Bn The King's Own (Royal Lancaster Regiment) and received the army number of 10700. We do not know why he transferred to the King's Own, but it may have had to do something with his brother Charles, because we know that Charles joined the King's Own and was given the army number of 10787. When the brothers joined the battalion they were based in England, but in October 1913 they moved to Labong in India. With the outbreak of war, the battalion returned home. After a period of training they were shipped over to France in January 1915. Just over a month later, William was wounded and returned home on 22 February 1915. He did not return to service and was medically discharged from the Army in August 1915. Serjeant Holmes' Medal Index Card. Charles and the battalion remained in France and fought through the Second Battle of Ypres. They were almost constantly in action in and around the Ypres area through that year. By September they had move south to take part in the Battle of Loos. Battle of Loos began on 25 September with ‘The Big Push’, a planned offensive to take place over a broad front between Le Bassée and the mining town of Loos in northern France. After 2 days of intense fighting, the Germans were driven from their front line trenches. The objective was then to hold the new position and continue the advance, bringing in reserve troops and taking out the wounded across what was no-man’s land. Here connecting trenches either hadn’t been dug or were woefully in adequate. The result was congestion and men moving across the battlefield were easily exposed to enemy fire. In early October the northern area of the front, around the Hohenzollern Redoubt, was held by the British 28th Division. Out of disrespect for the Kaiser, they nick named one of their captured German trenches “Big Willie”. It was here that Sergeant Charles Holmes was killed in action. 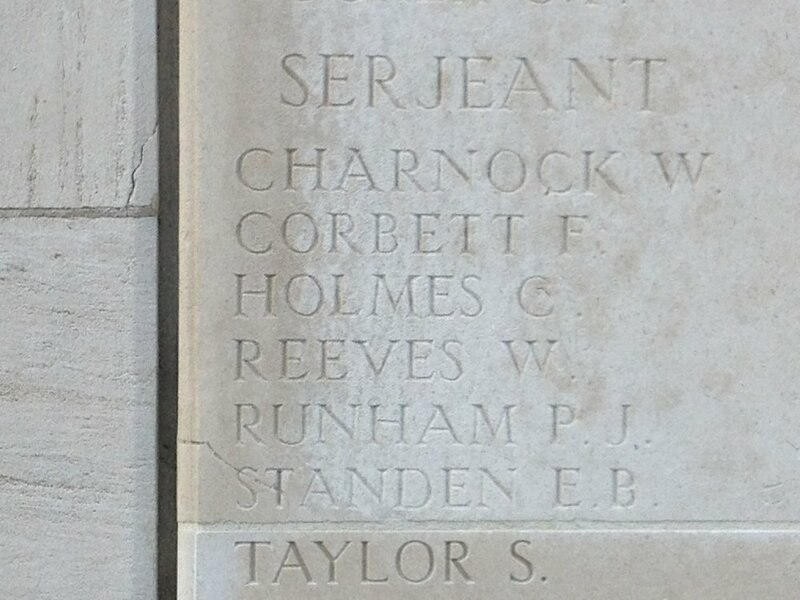 His body was lost and so he is remembered on the Loos Memorial. We hope that this page has been able to tell the story of Serjeant Charles Holmes. If you know of any information which might help to add to the story then please get in touch.